Another full-slate of fight cards on the boxing schedule for this weekend includes ESPN, HBO, and FOX. None of the bouts previewed in the article will stand out as must-see or overly meaningful fights to the common boxing fan. Of course to the fighters involved everything is on the line, some need to look impressive while others are in search of a scene-stealing upset. Yes, this weekend has a void of a marquee name or matchup, but as many avid followers of the sport know, a fight of the year candidate could arise in what some would classify as a ho-hum Saturday. You just never know and that’s why we will watch or at least DVR all three cards and piece by piece watch them. The ESPN broadcast probably stands out as a somewhat important card combined with action-packed fights. 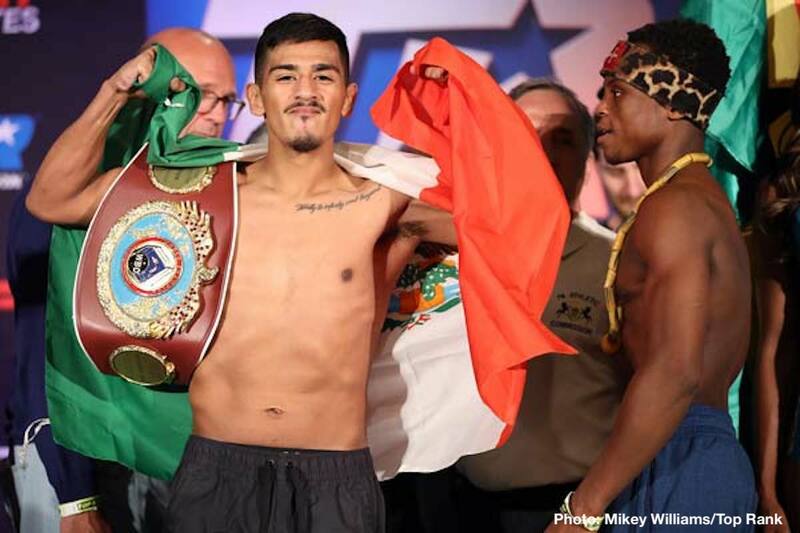 The main event between Jessie Magdaleno and Isaac Dogboe on paper is the most legit and could steal the show for the entire weekend. 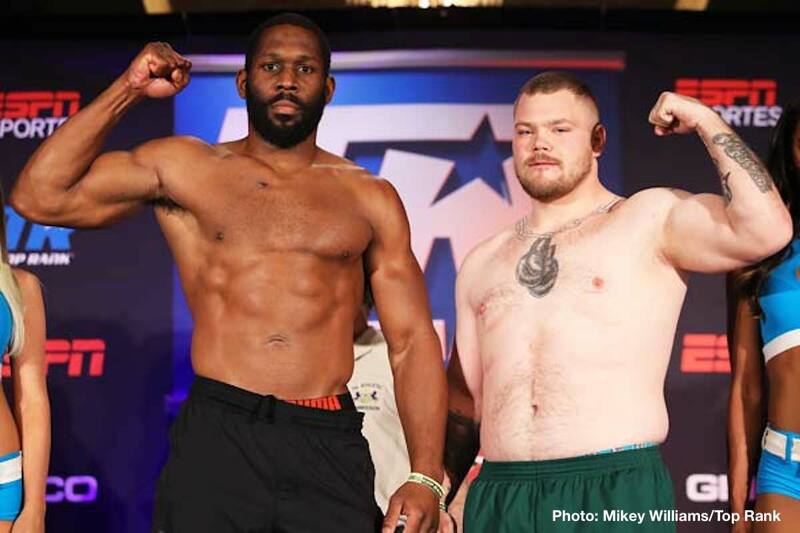 The two undercard bouts carry some interest, Bryant Jennings vs. Joey Dawejko and Jessie Hart vs. Demond Nicholson. Jennings really needs to get some of that swagger back he had 3-4 years ago when he fought hard in a loss to Wladimir Klitschko and showed his worth against Mike Perez and Artur Szpilka. A lackluster performance here would all but end Bryant’s true contender status. On the other hand Joey has nothing to lose and everything to gain in this co-feature slot. Last September, Jesse Hart gave a good account in a close-as-nails defeat to Gilberto Ramirez. Hart is aiming for a rematch so it’s a must he not only wins but does so in impressive fashion. Beyond a bad loss via technical-stoppage in 2014, Demond Nicholson has proved to be tough competitor. His recent loss and draw came against a still unbeaten prospect Steve Rolls and a then rising contender in Immanuwel Aleem. My Official Predictions: Jennings by late TKO and Jesse Hart by Unanimous Decision. The main event matches young hungry fighters in Magdaleno and Dogboe, broadcasting live on ESPN from the Liacouras Center in Philadelphia, Pennsylvania. Jessie Magdaleno comes in as the favorite but don’t you dare sleep on Isaac Dogboe. Even if it becomes a one-sided fight look for Dogboe to keep coming until the end. Dogboe engaged in an early fight of the year candidate back in January versus Cesar Juarez. Despite facing some real opponents with proven power in Nonito Donaire and Jorge Lara, it was Dogboe who managed to stop Juarez in 5 rounds. As a prospect and now champion (at contender level), Magdaleno is and has been inconsistently spectacular. His string of stoppages and overall record standing at 25-0 (18Ko’s) is a bit misleading. Although Donaire is a quality win the only other decent name is a guy like Erik Ruiz and that was well over 3 years ago. On the surface, Magdaleno has the skills to avoid a full out war with Isaac Dogboe. But Dogboe’s hard-nosed style will make Jessie dig deep in order to keep his unbeaten record alive. One thing is for sure when a fighter from Ghana steps in the ring, they leave their heart and soul in the squared-circle. Expect a fast paced bout that remains competitive throughout the 12 rounds. The house fighter will do enough for the judge’s to grant him the victory. My Official Prediction is Jessie Magdaleno via Split-Decision. From an HBO perspective, Daniel Jacobs and Jarrell Miller look to score dominating wins for what lies ahead in each Brooklynite’s career. 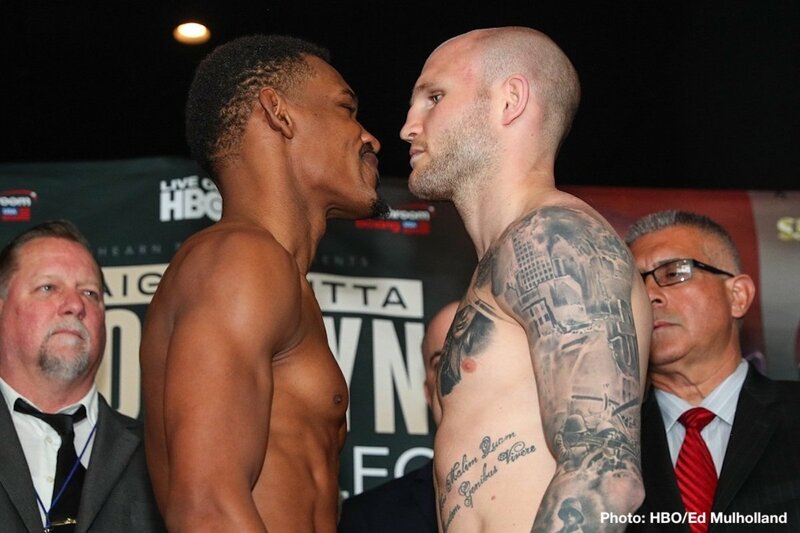 Jacobs is taking on undefeated junior middleweight Maciej Selucki and Miller faces a tough customer in Johann Duhaupas. It’s hard to see any other outcome then ‘The Miracle Man’ walking away victorious come Saturday night. Sulecki is a solid guy whose best outing is technical-stoppage over Hugo Centeno. Sulecki is not known for his punching power and that was at the 154-pound division. Jacobs will bit by bit slow down the Poland native as he cuts off the ring and begins to land heavy shots to the body and head. Maciej will be able to use some movement and his outside skills to score, but lack of power will be his downfall at some point. ‘Big Baby’ Miller weighed in at a career night 304 pounds, 21 pounds heavier than his last fight. That result could make this fight tougher for Big Baby considering Johann will have had a full camp under his belt. Miller tends to bring the fight to his opponents Duhaupas thrived at times on the inside versus Deontay Wilder a few years back. Let’s hope this turns out to be a heavyweight barnburner. My Official Predictions: Daniel Jacobs by mid-to-late KO and Jarrell Miller by Majority Decision. Side Note: Premier Boxing Champions has a misleading card as well this Saturday. The general public is scratching their heads on why the PBC chose these 3 fights to be on such a large outlet as Fox. That said, 2 out of the 3 bouts are intriguing and this card would be perfectly acceptable on FS1. Miguel Cruz gets a chance to shine in the main event taking on faded contender Josesito Lopez. The co-feature pits Anthony Dirrell and Abraham Han, a face-first style that Dirrell should be able to handle. The headliner and the opening bout between Jorge Lara and Claudio Marrero should produce fireworks for the fight fans. Both Lara and Marrero were recently in fights with Jesus Rojas and neither guy came out victorious. This is a big opportunity for each to regain momentum in their careers. My Official Predictions: Cruz by UD, Dirrell by TKO, and Lara via late KO.